A baby's average temperature is a little higher than an adult's. Healthy lies somewhere between 97 and 100.4 F, according to the BabyCenter website. Fevers are particularly dangerous in babies because they typically indicate the presence of an infection your baby's limited immune system may not be able to fight off on its own. If a baby's fever gets too high, he could experience seizures and other serious complications. Aside from determining the underlying cause of the fever, there are a few strategies you can employ at home to bring temperatures into the normal range. 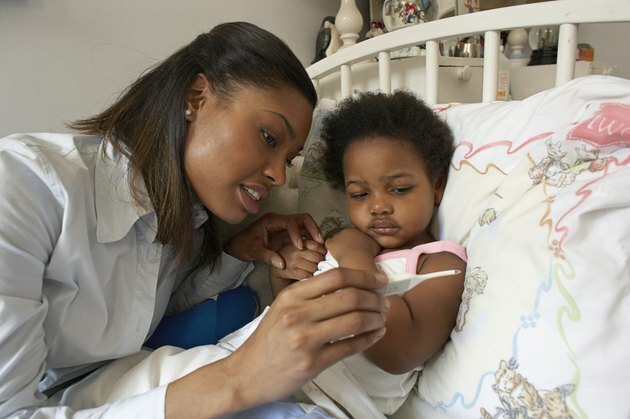 Hold off treating a mild fever if your baby is still eating, sleeping and behaving normally. Allow the fever to assist in defeating infection, recommends BabyCenter, but monitor his temperature and behavior closely for changes. Remove extra layers of clothing and avoid covering your baby with blankets while indoors. Set your thermostat to around 70 F.
Give babies older than 3 months a baby-sized dose of an over-the-counter fever reducer that contains acetaminophen. Give acetaminophen or ibuprofen to children older than 6 months, FamilyDoctor.org instructs. Always carefully follow the dosing instructions on the label. Discuss appropriate medications and dosages regularly with your doctor during your child's early months. Provide formula, breast milk, low-sugar fruit juice and other age-appropriate fluids to prevent dehydration that can accompany fevers. Sponge room-temperature water over your baby or give him a bath in lukewarm water one hour after administering fever-reducing medication, FamilyDoctor.org recommends. Avoid giving baths independent of medicine, as they can cause shivers and chills in your baby. Call your doctor any time a baby younger than 3 months old has a fever higher than 100.4 F. For babies between 3 and 6 months, call when the temperature exceeds 101 F. At 6 months or older, your baby should see a doctor if his fever exceeds 102 F for two or more days, or if he shows other signs of sickness. Call your doctor immediately if his temperature is 103 F or higher.